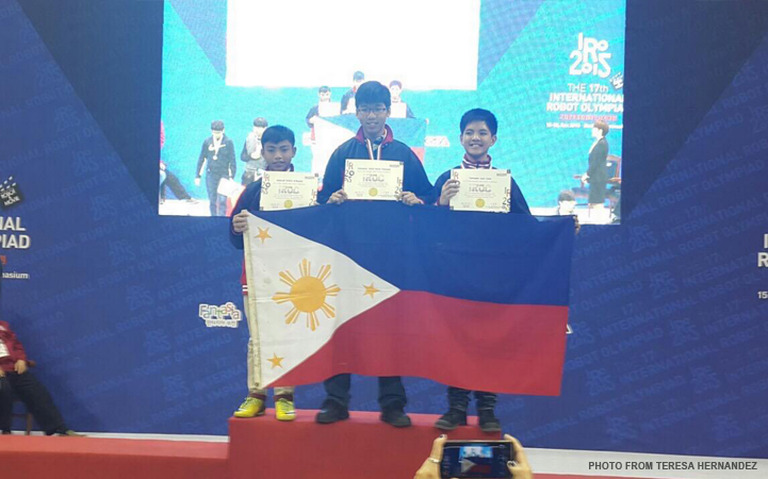 The Philippines ran off with three gold medals, four silvers, and seven bronze medals from the world-renowned International Robot Olympiad in Bucheon, South Korea from December 15 to 20 last year. The medal tally for the Philippine Robotics Team that competed in the International Robot Olympiad in Bucheon, South Korea continues to improve on past performances. The Robot Olympiad was held last December 15 – 20, 2015. The Philippine Robotics Team was composed of 120 young innovators that won in various categories like robot building and robot programming. The ages of the team ranged from 10 to 15 years old coming from more than 20 schools in the Philippines. Even at that young age, they were chosen based on their past performances in local competition and their keen interest in the field of robotics. In fact, even at that age, the Philippines sent a team of veterans! According to coach Albert Pagilagan, one of the coaches from De La Salle-Zobel, the students showed great talent given the competitive international crowd. The students trained an average three to four times a week. Although faced with more technologically advanced competitors from Japan, China and Korea, the team members had the passion and were aware of their potential as innovators and future leaders in the field of science and technology, a field that is the critical component of national development. One young gold medalist said he wants to eventually become a doctor and specialize in robotics for medicine. Another student said he wants to become an engineer for the progress of the country.